- Voltage Grade - 650/1100 Volts. - Relevant Indian standard - IS-7098 (Part-1) - 1988 or International standard - IEC- 60502 & BS-5467/DIN. - Number of cores. - Single, Two, Three, Three & Half or Four Cores. - Conductor - Size, wherever applicable size of reduced natural conductor. LT Heavy Duty Cables - POLYCAB brand, XLPE insulated LT heavy duty cables are as per IS-7098 (Part I) and are suitable for fixed installations. 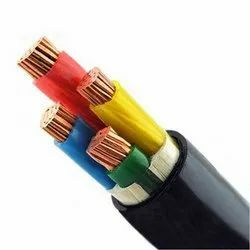 The Cables are suitable for use on AC single phase or three phase (earthed and unearthed) systems for rated voltage up to and including 1100 volts. These cables can be used on DC systems for rated voltage up to and including 1500 volts to earth.